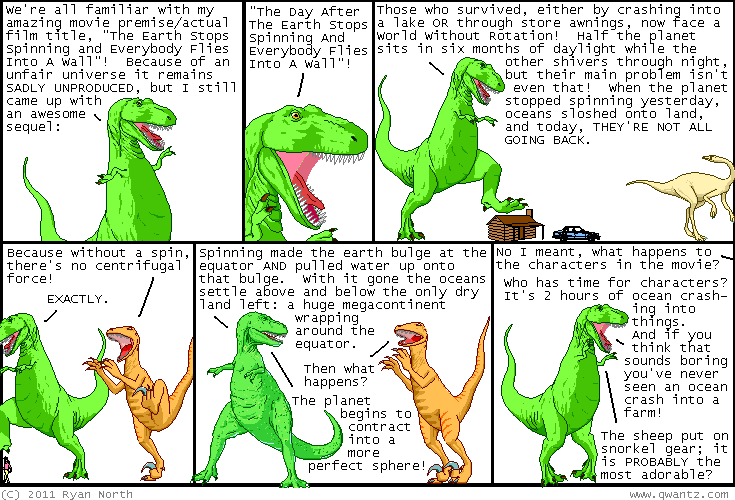 Dinosaur Comics - August 9th, 2011 - awesome fun times! Here's where T-Rex first proposed his movie, way back in 2004! FUN FACT: a few weeks after I wrote that comic, a local movie theatre had a "enter in a one-sentence summary of a movie you'd like to see here and win two free passes" contest, and I entered in T-Rex's idea, and won two free passes. That is what is called INDEPENDENT THIRD-PARTY VERIFICATION that this idea is awesome, THE END. One year ago today: guest comic: joel watson of hijinksensue.com!